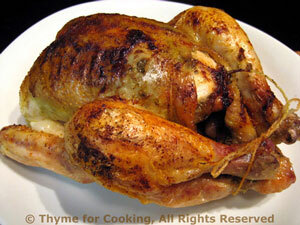 Roast Cornish Hens with Pesto, Thyme for Cooking easy main course. Small, perfectly roasted hens make an elegant presentation and are perfect individual servings (with maybe a snack leftover). If yours are larger birds, one may be enough, (you can split it in half before roasting) or fix two and have cold chicken/game hen for lunch tomorrow! Remember to put bowls for bones on the table - and wet towels for fingers. The pesto under the skin keeps it moist and adds some summery flavor. 1/2 cup (4oz, 120ml) chicken stock. Slip your finger under the skin on the breast and slowly loosen the skin as far as you can reach on either side of the breast bone. In a small dish, mix pesto and wine. Using a small spoon or your fingers, put as much pesto under the skin as you can easily manage. Any leftover just put into the cavity. Tie legs closed and bend wings around and under the back - so it looks like they are lying there with their arms akimbo. It keeps them from flapping and gives the hen something to rest on. Lay the hens on a rack in a shallow baking pan. Rub them with the olive oil and sprinkle on the paprika. Put into 400F (200C). Bake for 40 - 60 minutes, depending on size. After 30 minutes, remove and pour the white wine over each hen. Remove hens, cover with foil to keep warm and let rest 5 - 10 minutes. Pour pan juices into a small sauce pan. Add chicken stock and bring to a boil. Dissolve cornstarch in water and stir into pan to thicken gravy. Serve birds with gravy on the side.